It’s become apparent that my obsession may have gotten a liiiittle out of hand. Because of my slight interest in nail polish and only having 10 fingers and 10 toes (and a best friend who's sick of being my canvas!) I have so many colors I have never or rarely used. Every lacquer deserves a loving home and I hope that you may be the one who can provide that, my darling reader! I've also added some cosmetics and handmade jewelry/supplies will be added at some point in the future! All of these items are available for sale or swap, if you'd like to swap please send me an email. 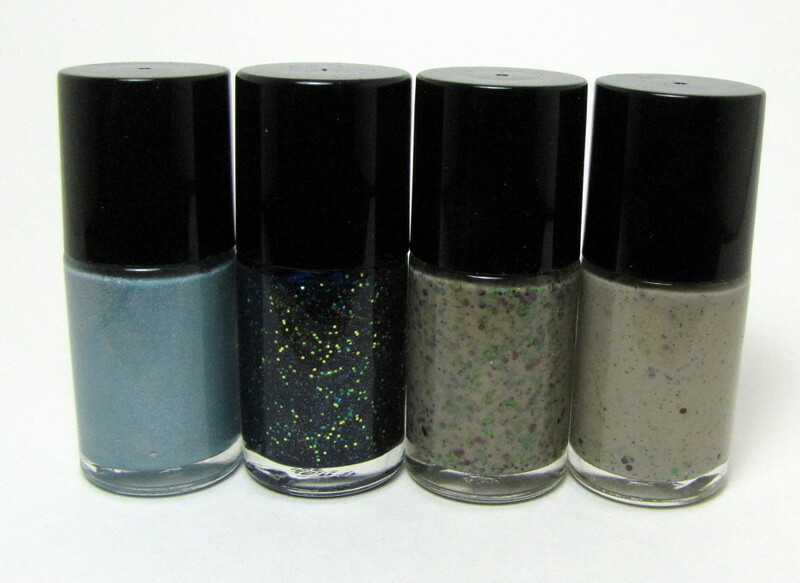 I highly prefer selling but I am open to swapping a larger amount of the polishes below for a smaller amount of your higher end polishes. Swatched means 1 to 3 coats (depending on if it's a glitter topper or not) swatched on one hand's worth of nails. BN means Brand New though it may have been opened and swatched on a clean sheet of paper only once. Payment is to be made via Paypal gift option ONLY! If you cannot pay via gift, I ask you send an extra $1 or more to cover the Paypal fees. Payment is due when I send you your total. If payment is not made within 24 hours I will relist the items. If interested, contact me using my contact form. Please specify which colors you'd like and include your US zip code or country name so I can calculate your shipping cost. I will respond with the total as soon as possible and items will be reserved for you for 24 hours after your initial email about specific items is sent. Once I hear from someone those items will be reserved for them, even if someone else emails me right after for the same item. Shipping costs DO NOT include insurance but they DO include tracking/delivery confirmation. If you are interested in insurance or signature confirmation please let me know so I can include it in your total (US only). I am not responsible for lost or damaged items. I will do everything in my power to package these securely but once I take it to the Post Office it’s in their hands. If you’re concerned, ask me about insurance. You are responsible for ensuring I get your correct address. If a package is returned to me you will need to re-pay shipping to ensure delivery. Once an item has been spoken for I will write (SOLD) next to it and after a few days I will remove the info. Please read descriptions carefully. 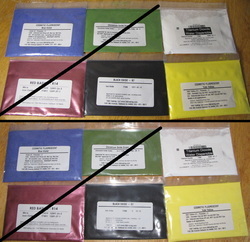 Some items are being sold in sets, not individually, or may be partially used. 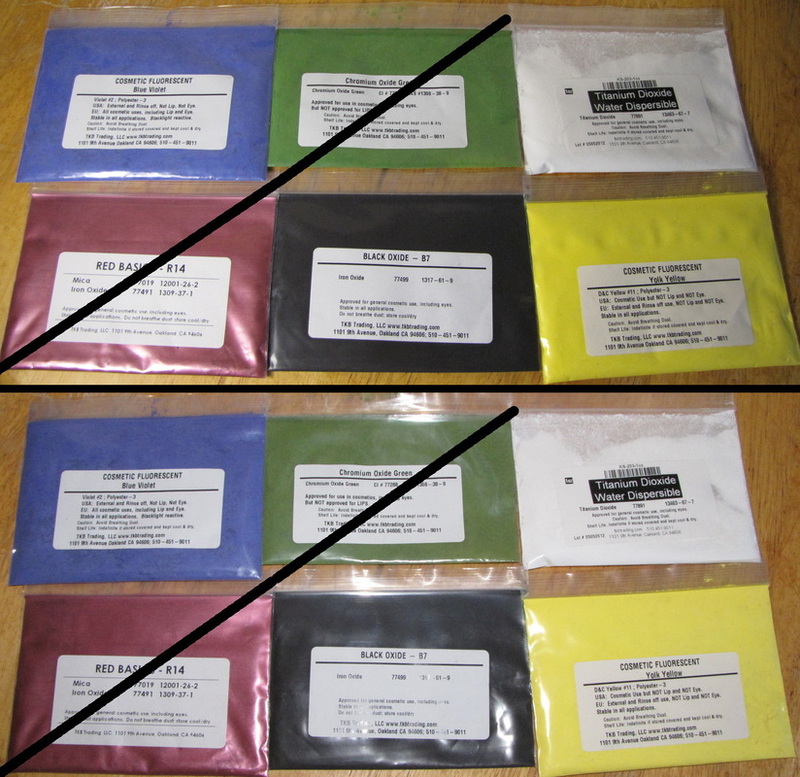 Some items have been sent for review and after my reviews are complete I consider the polish "payment" for my time; items sent for review will be marked as such. Sometimes people change their mind so if you're interested in a (PENDING) polish, email me anyways! Please contact me with any questions. Click the name of the color for a swatch photo if available or most colors can be Googled and click the image for a larger version. Want a box of surprise polish? Click here to order a mystery grab bag! 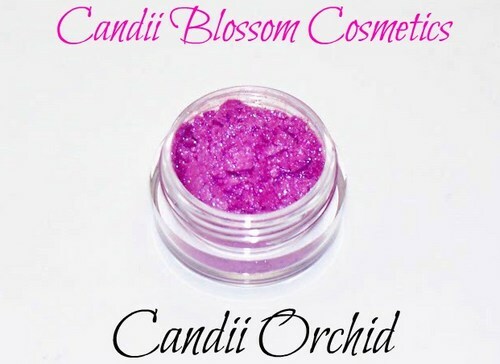 1 OZ COSMETIC FLUORESCENT BLUE VIOLET:DO NOT USE IN POLISH. Great for soap or non-lacquer cosmetics; will not disperse in lacquer base. 1 OZ TITANIUM DIOXIDE WHITE: DO NOT USE IN POLISH. Great for soap or non-lacquer cosmetics; will not disperse in lacquer base. 1 OZ BLACK OXIDE: Unsure how it will react in lacquer base. Magnetic but not sure how it will react as far as usual "magnetic" lacquers. Completely unused. 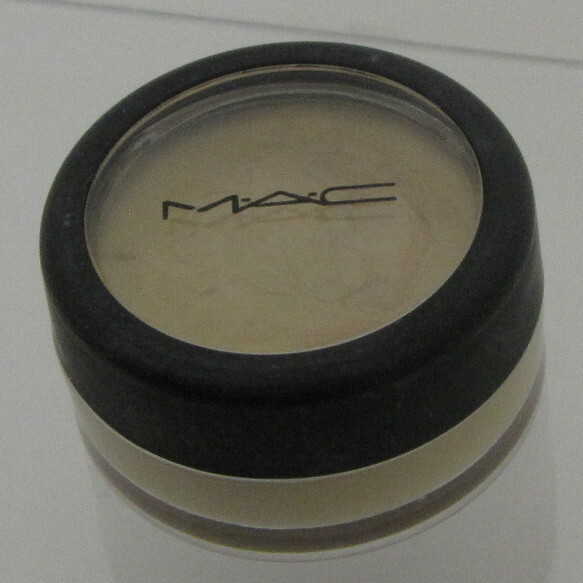 1 OZ COSMETIC FLUORESCENT YOLK YELLOW: Lacquer-safe. 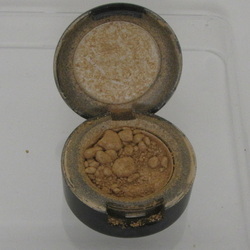 Be sure to mix thoroughly into base. 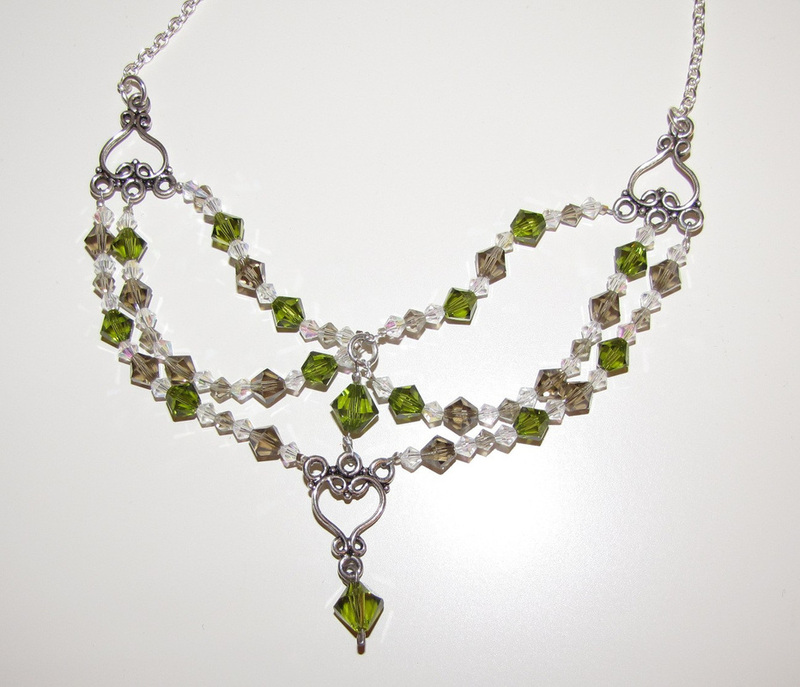 This gorgeous Swarovski necklace was inspired by elves and the woods. The vibrant green and smokey browns remind me of the forest, the elaborate design conjures thoughts of elegant elves. In sunlight, this necklace sparkles beautifully and the silver findings shine. This would be a wonderful addition to a Renaissance Faire costume or any dressy occasion. This necklace measures approximately 19" and has an additional 2" of drop for the design. These bead clusters are simple yet stunning, ready to be strung onto any chain! #1, 2, and 4 are a white, blue, and silver mixes. 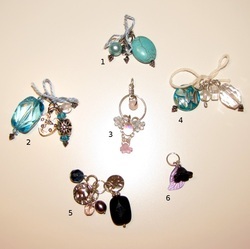 #3 is a beautiful silver, white, and pink combination. 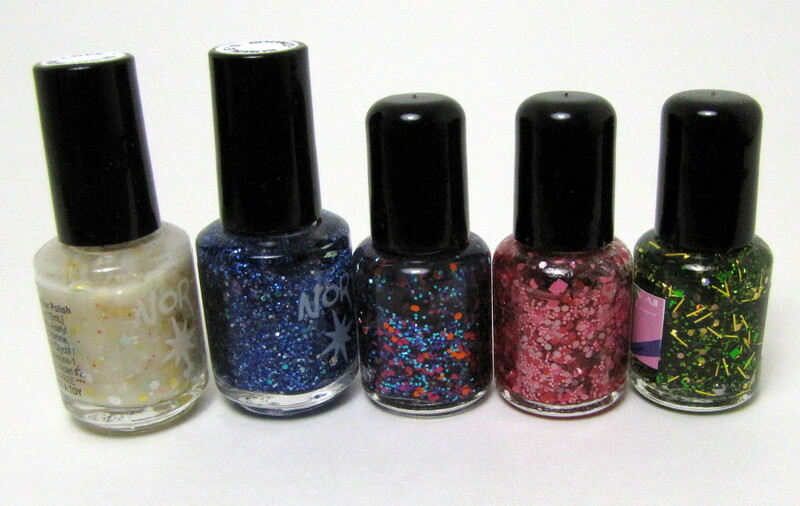 #5 shows a mix of black, dark blue, pink, purple, and silver. #6 is a black acrylic flower with a small purple leaf; looks great with casual wear or dressed up! 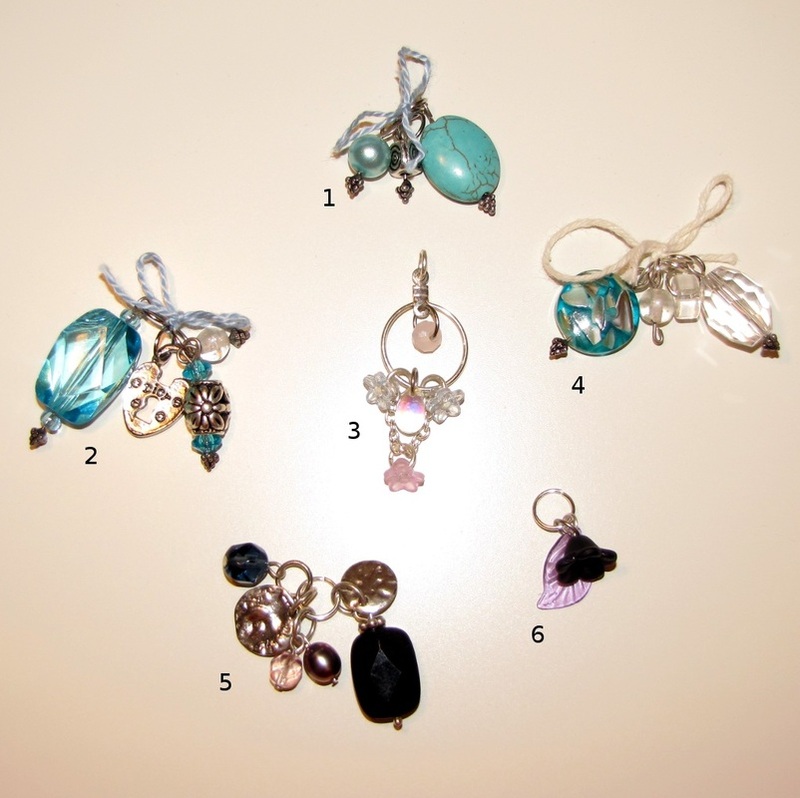 Please specify which charm you're interested (1 through 6). 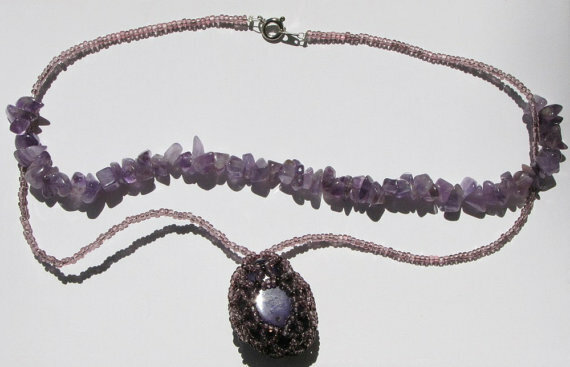 A gorgeous purple-dyed quartz stone charm with beaded netting over it on a beaded purple necklace. 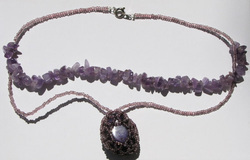 Partway down the necklace a string of amethyst chips crosses to form a choker. This necklace can make anything look dressed up and more formal or it can be worn with casual or semi-formal wear. Wear it with a black and/or white camisole for a great everyday look! 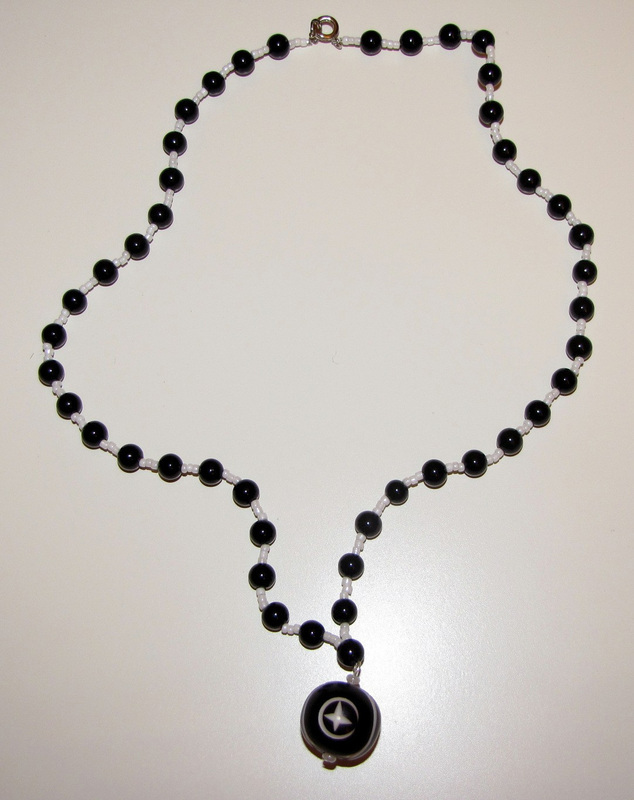 Necklace is approximately 19" long with 3/4" long charm. Do you like rainbows? I do! 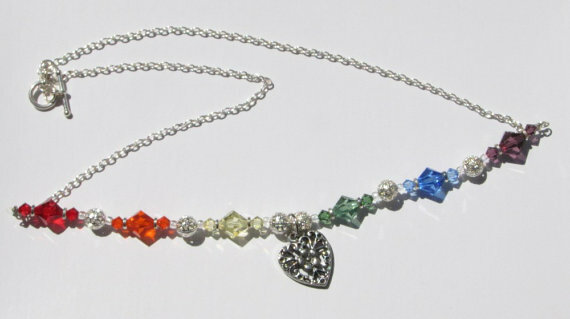 This 20" necklace is made with real Swarovski crystals and lovely little silver filigree spacers with a double heart charm. It has a simple toggle closure. 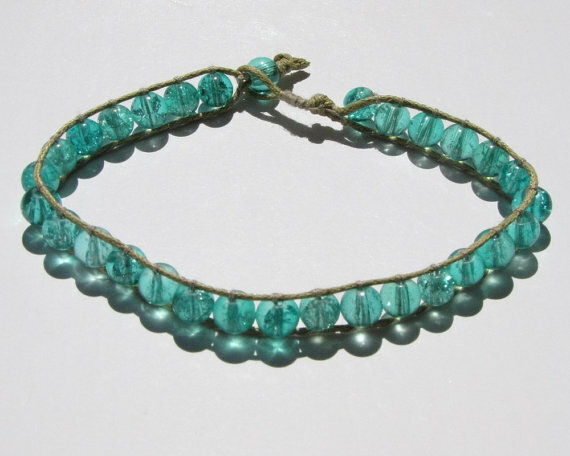 This 7.25" bracelet conjures thoughts of walking down the beach, finding sea glass or looking out at the ocean. This bracelet embodies "beautiful summer day at the beach" to me and I hope it does to you, too! Do you love the beach? 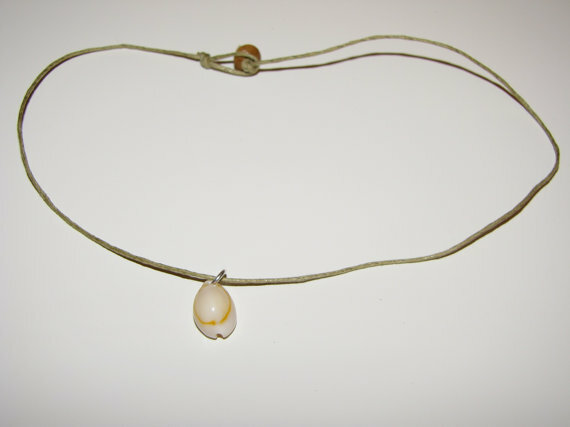 Show your love of the beach all year-round with this choker with a real shell charm. 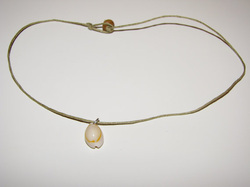 This choker is approximately 14" long, made of sand colored cotton cording and secured with a wooden bead and loop in the back. 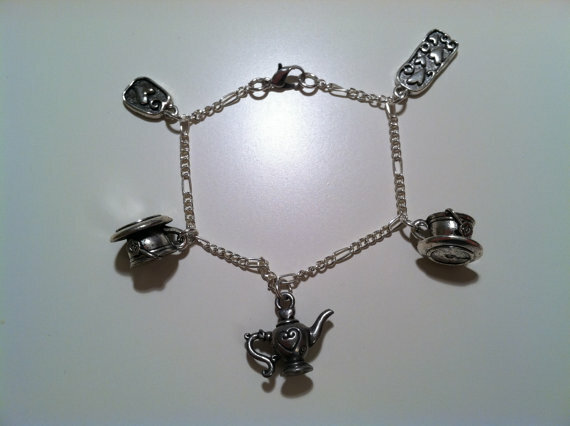 Show off your love of tea with this charm bracelet! 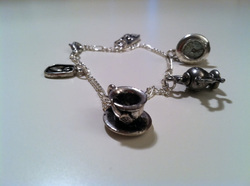 Two styles of heart charms, two teacups, and a teapot adorn this 7.5" bracelet on Figaro style chain. 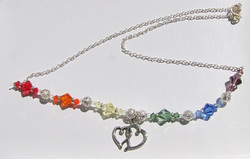 Wear this lovely charm bracelet to a tea party, tea shop, or just around town!